The main global hashtag is #FossilFree — follow the momentum and share your own content using it. You can also use a specific hashtag for your action. Check out the live coverage homepage for a feed of social media content from around the world and other updates. During the Global Divestment Mobilisation, we’ll be posting the most recent video to share here. We know who is responsible for the climate crisis. 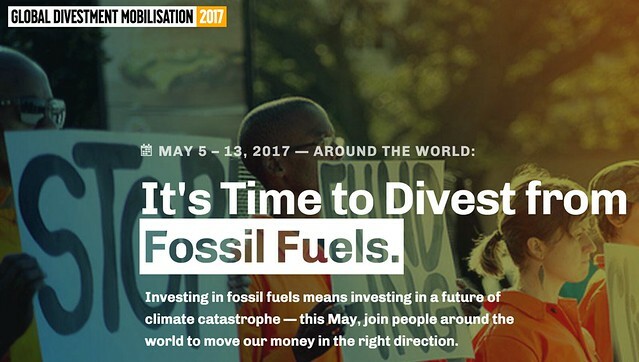 This May 5-13, we’re pushing our organizations and institutions divest from the fossil fuel industry in a global wave of activities taking place across 39 countries on 6 continents. Support the Global Divestment Mobilisation and stand up for a #FossilFree future. Climate change is intensifying in terrifying new ways. People everywhere though are doing their part to tip the balance of power away from fossil fuels and support a just, renewable economy. Amplify and support the actions of the Global Divestment Mobilisation. We’ll be sharing here the best photos from actions around the world. Download them and share on Facebook and Instagram. Check back for update. You can create your own Global Divestment Mobilisation sign to download and share on social media or print out and bring to your action. Over 60 fossil free actions have already taken place around Europe and we can’t wait for what’s to come! Here are some highglights.